Prevent & Eliminate Automotive Interior Trim NVH with our range of speciality lubricants. Our range of water-based anti-friction coating eliminates and prevents automotive interior trim noise and squeaks and rattles. A high-performance range of anti-friction coating is suitable for a variety of applications including ABS plastic. Automotive speciality lubricants to eliminate noise, vibration and harshness (NVH). Find out more about the individual products in the automotive antifriction coating range. No hazardous chemicals used in the formula reducing any serious health and safety concerns for users of the products. Much less cost than the traditional high density Perfluoropolyether (PFPE) oils that previously dominated the market. We can help you chose the right anti-friction coating for the right job. 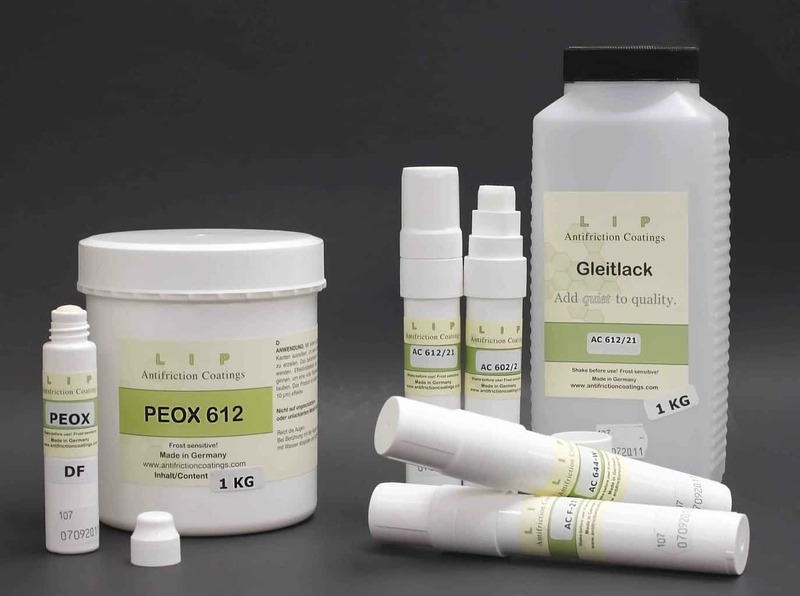 Our LIP products have a selection of applications from pens to tubs. Some products can be dispensed from bulk in automated spray systems. We consult with our customers to ensure they select the most appropriate product and in many countries we will visit customer sites to assist. 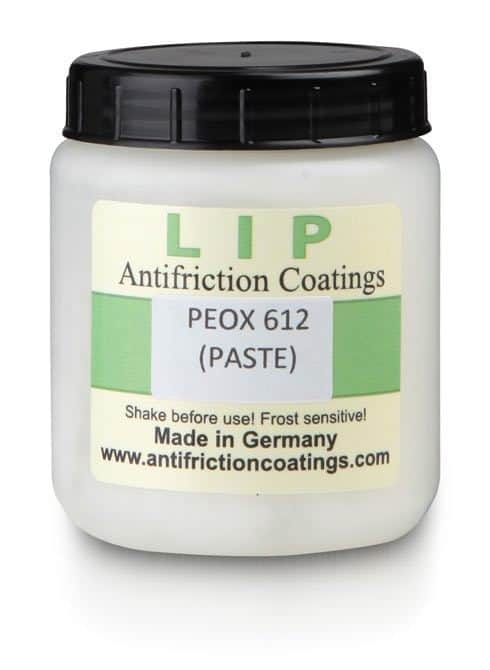 The LIP anti-friction coating range is designed to prevent automotive interior trim noise generation by slick-slip motion. The various water-based anti-friction coatings modify the surface of the ABS-PC, ABS plastic, EPDM, TPO and TPE plastic to prevent noise. 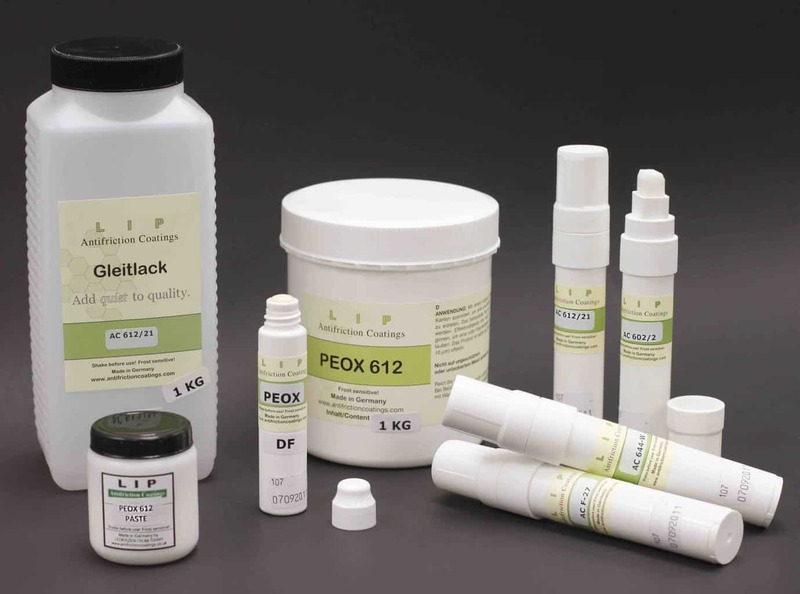 The LIP speciality lubricant range is also suitable for metals, glass and leather; check our product application page for further information. For the automotive aftermarket, the Squeaks and Rattles Kit provides a variety of our noise prevention products. The AC612/21 anti-friction coating was originally designed for leather and vinyl. But has become a multi-purpose product that is also suitable as a fault finding product. Multi-function speciality lubricant sometimes used for similar applications as the AC612/21. But where contact forces are higher or application areas are smaller. Multi-function speciality lubricant used for high pressure contact areas or where a paste like consistency product is more suitable/practical to use. If hard plastics are your problem surface then the AC F-27 anti-friction coating is the product of choice. Apply to plastics such as ABS and ABS-PC. AC602/2 anti-friction coating was developed for application for squashy rubber seals (e.g. EPDM or TPE blends) around windows, doors & sunroofs – a tricky noise problem! AC644-W is a hard, tough speciality lubricant for high-pressure areas. Originally created for functioning parts such as cup holders that need to glide smoothly.